Students at the GO4Research student internship programme launch, flanked by (on the left) DLAP assistant director Desiree Scicluna Bugeja and director Gaeatano Bugeja, and (on the right) Science Faculty dean Prof. Charles Sammut and University Pro Rector Prof. Joseph M. Cacciottolo. Nineteen fifth form students will this summer be given the opportunity to work with researchers at the University of Malta’s Faculty of Science conducting studies in areas such as plant ecology, insect studies and beekeeping, chemistry, quantum physics, geosciences, physical oceanography, statistics and operations and marine science. This was announced at the recent launch of the third edition of the GO4Research student internship programme run by the University of Malta’s Faculty of Science in collaboration with the Directorate for Learning and Assessment Programmes (DLAP). 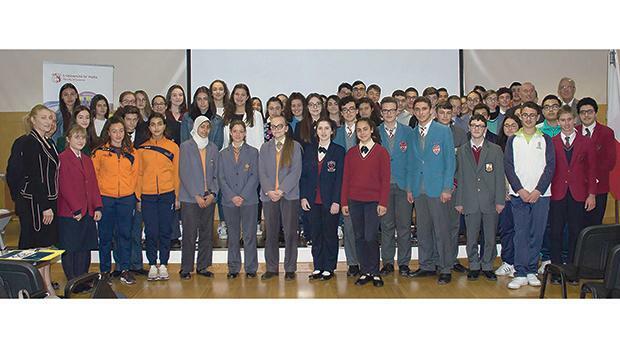 The launch was attended by 75 fifth form students from various secondary schools who had taken part in the Malta Junior Science Olympiad, accompanied by their educators. The event was addressed by Education Minister Evarist Bartolo, University Pro Rector Prof. Saviour Zammit, Faculty dean Prof. Charles V. Sammut, Director of Curriculum Management Gaetano Bugeja, and the researchers who will supervise the students’ internships. Also launched at the event were the GO4Research Awards Scheme for the best research project poster presentation, sponsored by the HSBC Malta Foundation.